MASAMI MORIMOTO was born in TOKYO, JAPAN. A video with Koto, Art, Calligraphy and Karate​ shot by Yukika Kudo. She held classes in Japanese textile design, Sashiko, stitching and Shibori Zome, resisting dyeing at the Vienna International School. Her introduction to the Koto took place in the family, her mother played the instrument. She started taking piano lessons at age 5. Her major in high school was music, which became a passion for her. Masami pursed art and design education in Japan and later in the USA, where also her Koto studies started in earnest. She attended the well-known Sawai Tadao Koto academy in New York City. As a Koto performer she played on both sides of the Atlantic, among others in New York, Washington, Baltimore, Philadelphia in the USA, and in Vienna, Linz, Graz in Austria, Szombathely, Hungary, as well as in Verona, Italy. She accompanied the world famous contemporary Koto artist, Kazue Sawai in her North American tour. She performed in the opening show at Shea Stadium for the New York Mets, and also at the award celebration of director Sofia Coppola for her movie hit “Lost in Translation” at Yale University. Her list of charity performances includes the 9/11 Firemen and Families event and the Food for Wheels fundraiser in New York, as well as the concerts held at the Vienna Hofburg and at the Ehrbarsaal in the Prayner Konservatorium with the Vienna Philharmonic for the victims of the earthquake and tsunami in Japan and also the Vienna Redcross Ball in Vienna City Hall. Most recently she had a concert with the Vienna Boys Choir in the Muth Theater. She held several Koto-workshops, among others in the Japanese School, and the Lycée Francais in Vienna. 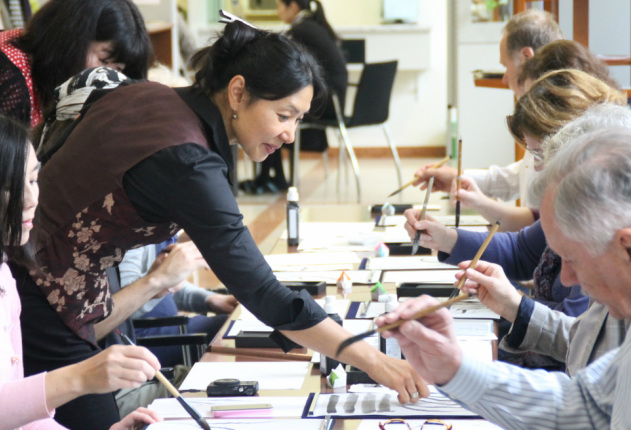 Masami is certified as a Professor of Calligraphy, Fifth Degree by the Japanese Calligraphy Educational Association and also received the Golden Award from the Association. Her calligraphy work was exhibited at Theater museum, in Vienna, Austria in 2013 and at several other occasions. She held Sumie, ink painting workshops at the Japanese Embassy and at the Danube International School and the American International School, in Vienna. Masami received her black belt from the World Seido Karate Organization in New York, USA in 1993. She won multiple Championships in New York at Karate tournaments in Kata. She conducted self defense classes at the Danube International School, in Vienna and also at the United Nation Women's Guild, and for private students.